HAYC3 is a rural revival and community arts organization based in Hoosick Falls, New York. HAYC3's goal is to restore rural sustainability and drive economic development through art, culture, education, and health. HAYC3 works toward these goals through being a community incubator, an art center, and a place of opportunity. For more information about HAYC3 and updates on all upcoming community projects and events, please visit HAYC3 or "like" us on Facebook. 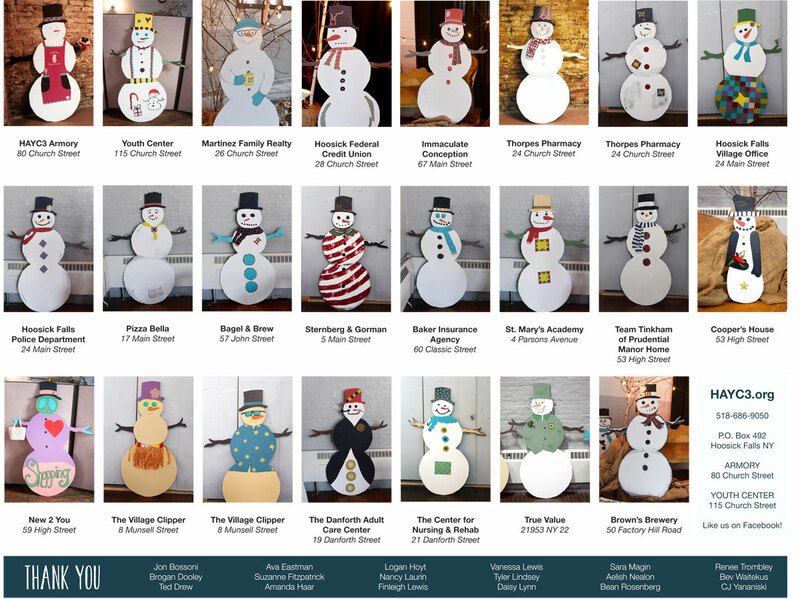 HOOSICK FALLS, NY On Saturday, January 10, 2015, HAYC3 presents the Hoosick Barn Quilt Snowmen Project with the installation of 22 handpainted wooden snowmen. They will be on display throughout the village of Hoosick Falls January 10 through the end of February. The project was created by the HAYC3 Artist Guild in partnership with the Hoosick Falls Central School Wood II class during the past three months in designing and painting the wooden shapes-making them come to life - each with its own personality and a barn quilt painted on it. "HAYC3 is an organization dedicated to rural revival through art and community," said Aelish Nealon, Executive Director. "Creating opportunities for community members to come together in a relaxed environment while creating art that will enhance the community, is a natural and prideful part of that revival process." 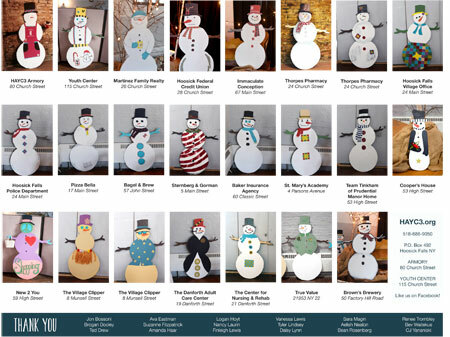 A free trail map with locations of all the snowmen will be available starting at 9:00am (during the Health & Wellness Expo) at the HAYC3 Armory located at 80 Church Street, Hoosick Falls, NY. For more information please call HAYC3 at 518.686.9050, or visit the website: hayc3.org. About HAYC3: HAYC3 (Hoosick Armory, Youth Center, and Community Coalition) is a rural revival and community arts organization based in Hoosick Falls, New York. HAYC3's goal is to restore rural sustainability and drive economic development through art, culture, education, and health. We work toward these goals through being a community incubator, an art center, and a place of opportunity. The HAYC3 Armory is located at 80 Church Street, Hoosick Falls, NY; for more information, please call 518.686.9050 or visit the website at hayc3.org. The arts in Hoosick Falls began with the discovery of Grandma Moses' paintings in 1938 in a drugstore window (today--Upsy Daisy and Bagel Shop) on John Street by art collector Louis J. Caldor. Grandma Moses captured the spirit and memorialized Hoosick's scenic countryside in her paintings. Today, that same beauty and tranquility acknowledged by Grandma Moses has inspired internationally and nationally recognized artists to Hoosick, which they now call home. Hoosick embraces the arts community, and recognizes the important role it has to play in articulating the identity of Hoosick, as well as the cultural and economic benefits that arts bring. For more info about Evan Wilson, visit http://www.EvanWilson.net. As a fourth generation member of the renowned Moses Family, Will Moses creates paintings that reflect the quiet beauty of this tiny community nestled close to the Vermont border. Visit Will Moses and the Mt. Nebo Gallery for more information. 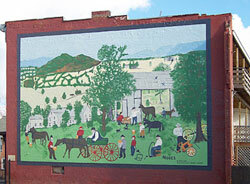 Mural of "Wagon Repair Shop" by Grandma Moses depicted on a 100 year-old building in the Village of Hoosick Falls.